Retail Price: $18.99 Log in for LOWEST PRICE! Lloyd Messer and his daughter, Dana Brown, made it to the peak of their dreams when they established Calcareous Vineyards in 2000. That peak was further enhanced by the fact that their vineyards are at the highest point in Paso Robles - over 1,800 feet above sea level. The same winemaking team that makes Calcareous label wines also makes Twisted Paso. This is to assure that everything they put their name on is worthy of it. That's a rare and beautiful thing in the wine business. Those are the type of wineries we want to support. 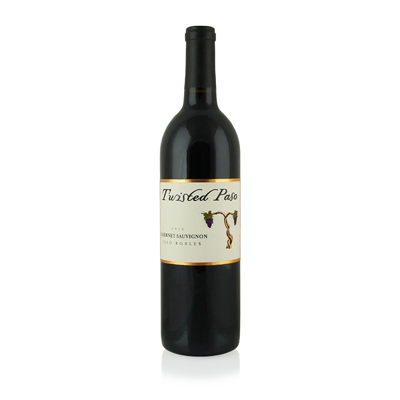 The grapes for their Twisted Paso label come from two highly respected vineyards in Paso Robles, Javadi and Seashell. Most of the grapes from these two vineyards grace bottles of $40 to $60 wines. But this father and daughter team have elected to make their great wines more affordable. And we're glad they did. Our selection tastes like what it's supposed to - a great expression of Paso Robles Cabernet Sauvignon and an expensive one. They just left out the expensive part. The integrity and pedigree show in this selection. The altitude's cooler growing environment means the grapes have less heat to deal with, so they can produce a concentrated, lower-alcohol wine bursting with flavor. Rich, red and black fruits abound and are held in check by soft tannins. And the finish is as exciting as the beginning.